The Institute is a Laboratory Without Walls and think-tank. Its basic task consists in acting as a facilitator and bridging agent between dedicated institutions, programs, centres, but also between disciplines and across science and society. 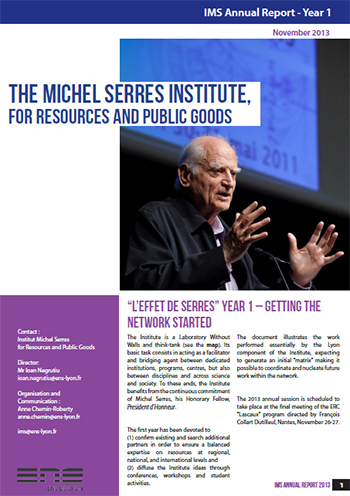 To these ends, the Institute benefits from the continuous commitment of Michel Serres, his Honorary Fellow, President d’Honneur. diffuse the Institute ideas through conferences, workshops and student activities. The document illustrates the work performed essentially by the Lyon component of the Institute, expecting to generate an initial “matrix” making it possible to coordinate and nucleate future work within the network.